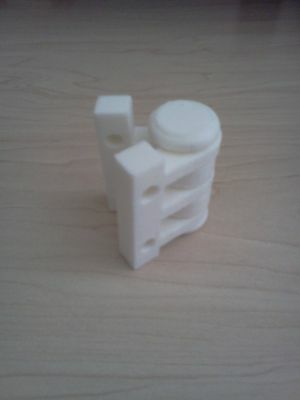 Each STL file is a simple one-print hinge: the "door hinge" file defaults at 3.9 in. height and 0.5 in. diameter, while the basic "hinge" file defaults at 2.2 in. height and 1 in. diameter. (Support hole diameter defaults measure 0.25 in. for both assemblies.) 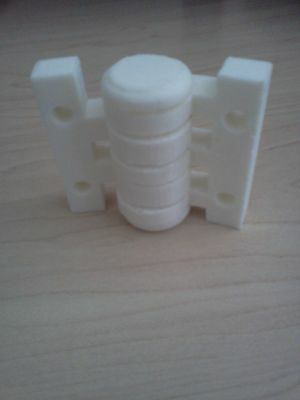 Print this assembly upright: the hinge assemblies have gaps to enable support removal. You may not be able to remove all of the support material, but remove as much as you can before trying to rotate the hinge, and leave the rest help stabilize the parts. Either hinge can rotate more than 270 degrees independently, and two door hinges from solid-fill ABS can support a lightweight wooden door. NÃO CONSIGO IMPRIMIR COM AS PARTES MONTADA. Anthony, fantastic work...thanks for sharing!